The most telling room in any home is the bathroom. Whether it be a master, a full, a ¾ bathroom, or a powder room… the state of the water closet is like peering through a keyhole to the condition of the rest of the home. Is it outdated, dirty, or broken? Bathrooms should inspire a feeling of cleanliness and hospitality, not of unease. Take care of your home and its inhabitants by having a relaxing lavatory. Handyman Matters has identified a few bathroom ideas, to improve each powder room in your home. 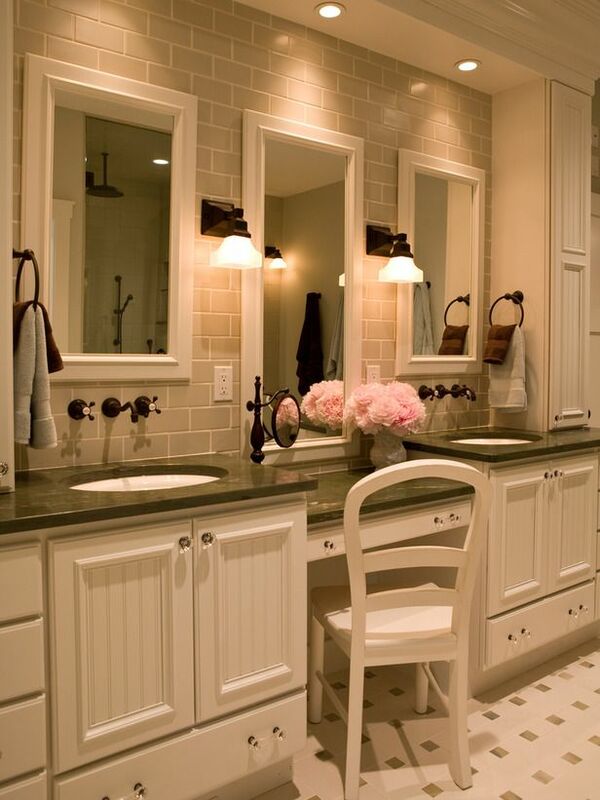 The biggest challenge for the master bathroom is organization. For a room designed for the daily routines of (typically) two people, storage can be hard to come by. For those of us with more beauty products than we know what to do with, there’s the bathroom vanity. In modern bathroom designs, the vanity can be tucked away, between sinks, in extra counter space, or it can stand out as a small table. A full bathroom is designated as having a shower, a tub, and a toilet. When you have a full bathroom you typically have a spacious room. What’s better in a large space than a statement piece? 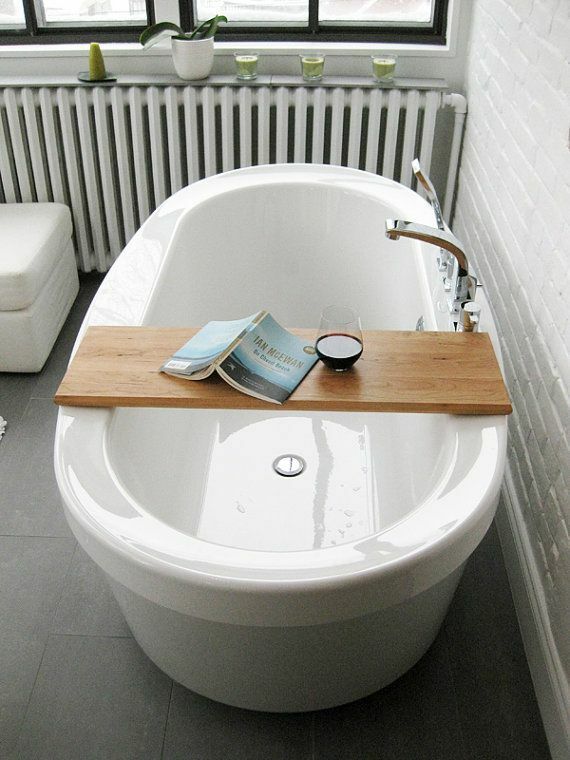 The latest design trend for the modern bathroom is the free standing tub. Whether it be Victorian inspired, contemporary, or more of the Jacuzzi vein – there’s a variety of kinds to help you bathe in style. The smallest bathroom is the powder room. 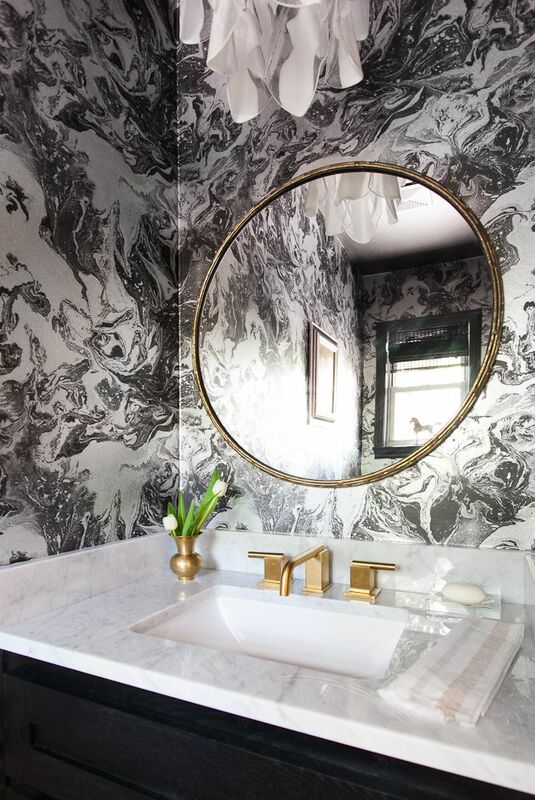 When it comes to the ½ bath, the powder room has just a toilet and a sink. It may be small, but it is one of the most functional bathrooms in the home, most commonly serving the needs of your house guests. Although this room is compact it doesn’t have to be bland. 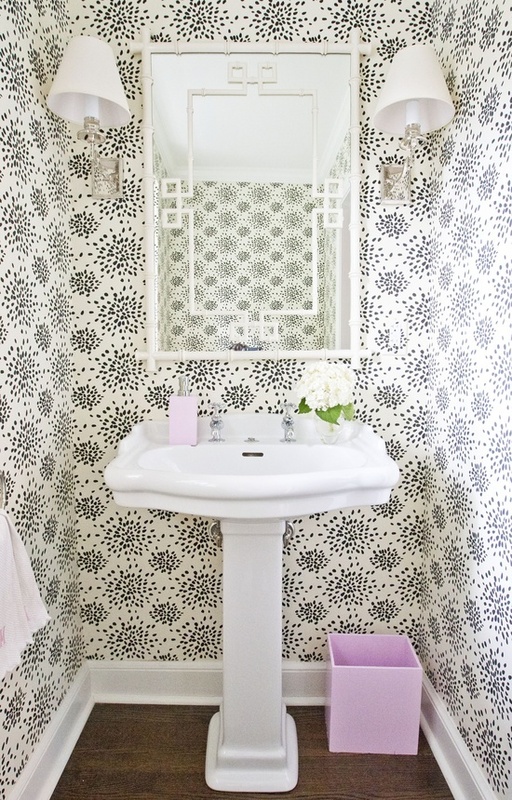 The best way to add interest to a small bathroom is by installing printed wallpaper. Just the essentials in this room: a shower and toilet. 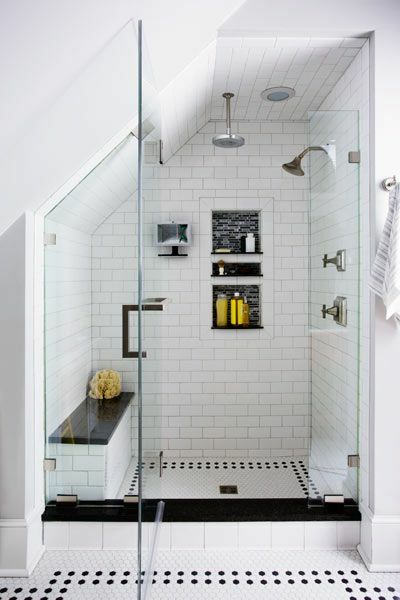 Smaller rooms with showers often fight the effects of humidity. For this room think water resistant, think tile. Unlike wood flooring and wallpaper, tile rarely warps or peels due to water damage. A bonus feature is that there are many graphic options for tile to add a little intrigue as well as functionality. Add a little luxury to your life and the lives of your house guests with a bathroom remodel. The summer is a great time to revamp different areas of your home. Whether you need repairs, extra cabinets, new appliances, or an accessible install – Handyman Matters is here to make that a reality. Call us today to schedule your free estimate, 866-FIX-MY-HOME, or head to handymanmatters.com. Ceramic tile is easy for even someone who is not a regular do-it-yourselfer to install, whether on the floor, the walls, or a tub surround. Its popularity stems from the fact that tile is very hard, water-resistant and easy to clean. It does take a bit of patience and diligence and a fair amount of measuring. So, keep in mind the traditional credo of carpenters: Measure twice, cut once. There’s a difference between floor and wall tiles. Wall tiles are thinner and smoother than floor tiles. An installation job will need two types of tile. One is filler tile, which will take up most of the surface, and the other is trim tile which goes around the edges of the room and around the corners. Shower stall walls or a tub surround should be prepared with a cement backboard or a waterproofed drywall before the tiling begins. Make sure to take out any old material at the point where the tile will touch the top of the tub or the base of the shower. Leave a quarter-inch space for caulking. Be sure to lay out the job precisely. Ideally, tiling should start in the center of the wall or in the center of the floor. Must-have tools for a tiling job include a tile cutter, a notched trowel, a notched spreader, a level, a rubber float, nippers, roofing felt and roof cement, a stapler and staples, silicone caulk, soap dishes or other accessories, painter’s tape, mastic, grout and grout float, grout saw, hammer and cold chisel, shims, drop cloths, a rod cutter, a sponge and a glass cutter. A rented wet saw is optional. You should use some of the tools to experiment on some old tiles, perhaps the ones taken off the wall to make way for the new ones, before the real job begins. Apply adhesive in sections of small squares until you feel comfortable setting the tile. Keep the room as well-ventilated while you work, to prevent over-exposure to the fumes of the adhesive. If a tub surround or shower stall has been freshly tiled, neither the tub nor the shower should be used for at least two weeks. If the tiles have been put on the floor, they shouldn’t be stepped on until the mortar is hardened. If you decide you need to adjust a floor tile that’s too far to reach, find a sturdy piece of plywood to step on. And, of course, if any of this just seems too overwhelming to tackle, you can always contact Handyman Matters to have a professional complete the work for you, call 1-866-FIX-MY-HOME or enter your zip code above to find the location nearest you! If you want to give your kitchen a facelift, consider replacing or adding a new tile backsplash. This can give your kitchen a bright modern appearance without a lot of effort. The nice thing about adding a new backsplash is that it is not very hard to do. If your existing backsplash is painted drywall, it’s quite straightforward. Even if you have an old tile backsplash, it is still not difficult – just messier in the beginning. If your existing backsplash is painted drywall, you can install your new tiles right over the top. Just sand the area to rough up the surface and get ready to install. If you have an existing tile backsplash, your best bet is to remove it totally. This will involve actually cutting the existing backer (usually drywall) and getting rid of both it and the attached tiles. For the best results consult with a professional to determine if you need to replace the drywall before installing the new tile. Handyman Matters can help answer all of your questions. Determine the length of your backsplash, and then measure the distance from the top of the counter to the bottom of the wall cabinet to calculate the area you’ll need to cover with your tiles (length x width = area). Now that you know how much space you have, figure out your tile pattern. Use graph paper and draw a scale outline. 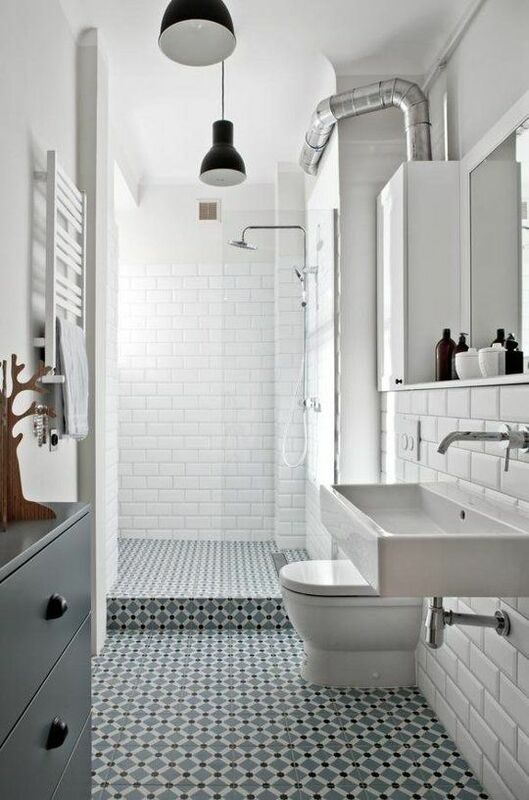 The most common tiles used for backsplashes are 4 x 4, 6 x 6 or 3 x 4 subway tiles. You could also use 1 x 1 tiles attached to a back mesh if you like the appearance better–the choice is yours. Find the one that best fits your style. Just be sure that the tiles are glazed when you get them; this will help prevent stains, moisture and grease from ruining your tile. When you calculate your tile quantities, don’t forget to add about 10 percent for cutting and waste. Remove the stove and range hood and anything else that will be in your way when you are working on the backsplash. Shut off the power to any outlets or switches and remove the cover plates. If your tiles are going to be running over any gaps (like where the range will be), install a temporary ledger board along the base of your tile line to help hold them in place during installation. Mark the visual focal point of your layout and use a level to draw a starting line through it. You’ll use this to line up your tiles vertically. Now, lay out your tiles on the countertop or the kitchen floor so you can follow the pattern. Starting at the center, begin the bottom row by applying tile mastic (a ready to use tile adhesive) or thinset mortar to a small section of the wall using a grooved trowel. Put the edge of the first tile on the vertical line leaving a gap of about 1/8″ on the bottom – this leaves space for a bead of caulk later in the process. Press and wiggle the first tile into place, then put in a temporary 1/8″ spacer (vertically for easy removal when the mastic dries). Install the second tile using the same process. Continue installing tiles working away from the centerline, wiggling them into place and putting spacers between each. Follow your pattern and install any decorative/highlight tiles as part of the field. When you get to a place where you need to cut or trim a tile (under a countertop, end of a row, around an electrical outlet), cut the tile as part of the installation – don’t leave an opening and plan to come back. Cutting tile can be a hard task; the easiest way to cut a tile is using a tool called a scoring cutter. Using one is a two-step process – mark the tile where you want to cut it, then place the tile in the tool and score a mark in the tile surface. Then, using a sharp motion of the tool handle, the cutter will break the tile along the scored line. Cutting openings for an electrical outlet can be more challenging. Depending on where an electrical outlet fits into your pattern, you may be need to cut two tiles using the scoring cutter, and then use tile nippers to cut out the opening and put them on each side of the outlet. After the tiles are installed and the mastic has been allowed to set up overnight, it’s time to grout. Use a sandless grout (to avoid scratching the tile surface) and mix it according to manufacturer’s directions. Apply the grout using a rubber float. Push it well down into the gaps between the tiles, then holding the float at a 45-degree angle remove the excess. Allow the grout to set up for about an hour and then clean off the hazy surface on the tiles. Use wet sponges, rinsing them often in clean water to wipe away the film. Buff the tiles with a clean dry cloth to bring out their natural beauty. You will likely need to install box extenders to your electrical outlets before you can reattach the cover plates. Finally, apply a bead of tub and tile caulk (the same color as the grout) all along the bottom seam where the backsplash meets the countertop. Following the steps above will help you install a new backsplash into your kitchen. Make sure you pay attention to details and follow each step, but if you happen to come across a problem, the professional craftsmen at Handyman Matters can finish the project for you, or help you along the way. Click Here to find a location near you.